One of the cool things about Palm's webOS is that they are pretty cool with the third-party developers and home Homebrew applications. 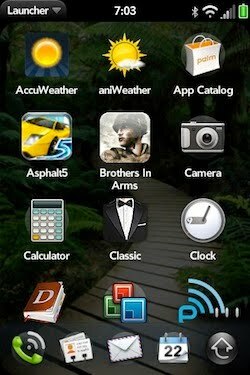 Having said that, Glass Effect Launcher is my favorite webOS patch to date. It is also the first patch I've ever applied to my Sprint edition Palm Pre. As the name applies, when you apply the patch, the stock grey background in the webOS app launcher is replaced by a Windows Vista looking smoked glass background. The photos above show what my app launcher and Universal Search screens look like after applying the patch. 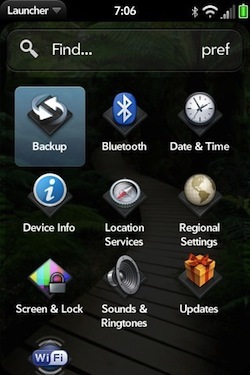 I think that patch give webOS a more refined and finished look than that boring grey background. Hopefully HP and Palm will add some more refinements in webOS 2.0 that will give our favorite little OS that could a more grown up and professional feel to it. To learn more about Glass Effect Launcher, check out the patch's thread over on PreCentral. If you want to learn more about Homebrew apps and how to get them installed on your Palm webOS smartphone, check out PreCentral's Homebrew Apps Gallery.